The last tantra has three main parts, the father tantra (pha rgyud), the mother tantra (ma rgyud), and the non-dual tantra (gnyis med rgyud). The Kagyu lineage emphasizes these three tantras in general and the mother and the non-dual tantra in specific. 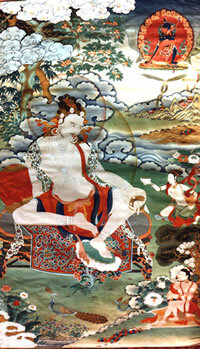 All tantric practices are basically comprised of two main elements – training in the Development Stage (bskyed rim or Utpatti-krama), the visualization practices, and training in the Completion Stage (rdzogs rim or Sampanna-krama), the fulfillment, perfection, or dissolving stage practices. Gampopa, whose coming was prophesied by the Buddha, taught Mahamudra in these three different ways and this has become a tradition in the Kagyu lineage. This tradition and the lineage is continued to the present day. While taught in all Kagyu Schools, it is taught very clearly in the Karma Kagyu lineage. Gampopa’s Dakpo Kagyu tradition gave rise to four elder and eight younger lineages * founded by his accomplished disciples. * The direct disciples of Gampopa and his nephew Gompo Tsultrim Nyingpo have founded the four elder lineages, and the next generation stemming from them, especially Pakmodrukpa, are known as the eight younger lineages. Here elder and younger are simply refering to the time of establisment. The eight younger lineaeges of the Kagyu lineage have developed within the Phaktru Kagyu. Founded by Drikhung Kyopa Jigten Sumgyi Gönpo (1143-1217). Drikung Kyapgön Chetsang Rinpoche (b. 1946), who resides in Dehradun, India, is the present head of the Drikhung Kagyu lineage. Founded by Drupchen Lingrepa Pema Dorje (1128-1188), a student of Phakmo Trupa, and his disciple Chöje Tsangpa Gyare Yeshe Dorje, (1161-1211). They founded the first seat of this lineage, Namdruk Monastery in central Tibet. Later, Kunkhyen Pema Karpo (1527-1592) founded the Druk Sang-ngak Chöling in southern Tibet, which became the main seat of this lineage. Kapgön Drukchen Rinpoche, who lives in Darjeeling, India, is the present head of the lineage. This lineage, adopted as the state religion of the Kingdom Of Bhutan, originally was brought there by the great Drukpa Kagyu master Shaptrung Ngakwang Namgyal and flourished in Bhutan throughout the centuries. His Holiness Je Khenpo of Bhutan and the present King of Bhutan Jigme Senge Wangchuk are the head of Drukpa Kagyu in Bhutan. Founded by Taklung Thangpa Tashi Pal (1142-1210). Taklung Shapdrung Rinpoche, is presently heads the lineage, along with Taklung Matul Rinpoche and Tsatrul Rinpoche. Founded by Zarawa Kalden Yeshe Senge (? – 1207 d.), a student of Phakmo Trupa, and his disciple Yasang Chöje Chökyi Mönlam (1169-1233). Yasang Chöje founded the Yasang or Yamsang (g.yam bzang) monastery in 1206 C.E. and the name of the lineage came from that. Founded by Rinpoche Gyatsa, nephew and a student of Phakmo Trupa, and his disciple Trophu Lotsawa Champa Pal (1173-1225). Trophu Lotsawa founded the Trophu monastery and institute in the Tsang region of central Tibet and the name of the lineage derives from this. Founded by Gyergom Tsultrim Senge (1144-1204), who was a student of Phakmo Trupa. He founded the Shuksep monastery in 1181 C.E., in the Nyephu area in the Chushur region of central Tibet, from whence comes the name of the lineage. Founded by Yelpa Drupthop Yeshe Tsekpa (century?) who founded the monasteries in Yelphuk. Founded by Martsang Sherab Senge, a student of Phakmo Trupa.